Freya Bramble Carter has written this article for anyone thinking about trying pottery for the first time. Freya is one of our pottery teachers on Obby and is great with beginners. She grew up around pottery with her father, Chris, being heavily involved in the scene. 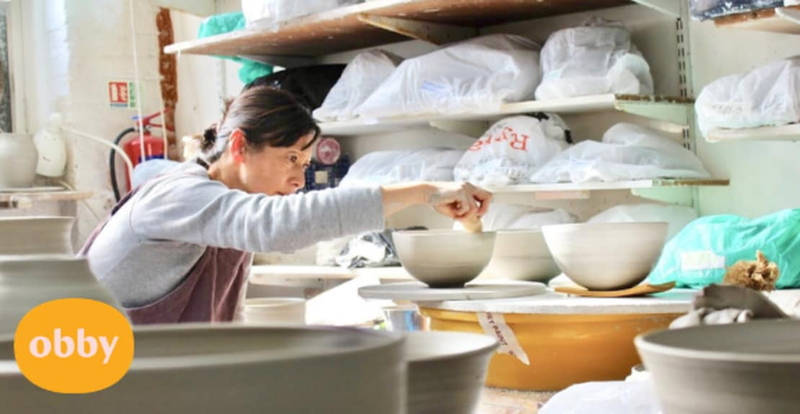 Freya has since gone on to make a name for herself amongst the London pottery scene and we are lucky to have her passing on her skills to our Obby students! When it is your first time experiencing clay many are overwhelmed by the feeling of this beautiful material. It feels great squidging it around in your hands, pull it in a few directions and you’ve made something! There is a fascination with the touch and tact-ability of it that connects people. Clay is kind and nourishing but also tricky and needs figuring out. For those that use it for therapy or those that throw 50 bowls a day, clay is truly magical to many. But when it comes to throwing on the pottery wheel, it can be a slight shock to the system especially if you don’t drive! Even if you have done many hand-building workshops prior to your throwing session, they are miles apart. Potters may vary in techniques as there are many ways to throw a pot and none are wrong or right, you eventually pick the ways that work for you. In theory, throwing is very simple, the wheel goes round, you stay still and anchored, whilst stretching the clay into a shape with various techniques. But practically this is a whole other ball game. The coordination is one thing to get your head around, along with rhythm and pressure. There's a lot going on at first. And to be honest the beginning stages may feel very difficult for a while- but lots of repetition soon eases you in, as it can take many hours, weeks, years.. to master pottery throwing. So I would say just enjoy it and have patience! It is very opposite to the way our fast techno fuelled lives to run. In fact the more relaxed you are the more it flows, going at a snail's pace is always a good place to start especially if you are feeling nervous; keep breathing! Every pottery studio will be run slightly differently and every potter will have a slightly different technique. None are wrong or right, better or worse. After a while of requiring all these techniques, you eventually pick and stick to what feels most natural and comfortable for you. There are hundreds of different clays all around the world but most of them fall into either a type of stoneware (high fire clay) or earthenware (low-fire clay). Depending on what a potter is specialising in they will use a specific clay type to achieve the look, feel, durability of the clay that is needed, for instance, we use stoneware at our studio because we make large, sculptural pots, for indoor and outdoor use, so the clay must be strong and cope with all weather conditions. But we can also use our finer stonewares or porcelain for domestic use i.e cups and bowls. A beginner will always use a soft, fine grogged clay to start with it will be soft enough to manipulate, and have small grogged particles, if any, so that your hands do not feel sore afterward from all the exfoliation (grog is fired clay crushed into course or fine particles to strengthen clay). Professionals may use harder clay for large-scale work so it doesn’t collapse so easily. The teacher may ask you to start your session by kneading/ wedging your clay to get it into a workable condition which is always a good skill to learn for the longevity of your pottery career or they may have already prepared the clay in small balls for you to save time. Your teacher will most likely show you how the whole throwing process is done from start to finish first with a demonstration, maybe show you some examples or diagrams to cater to different types of learning and then go through the whole process on a 1 to 1 level. When it is your first time you may feel you need a lot of attention and support to guide you through the whirlwind of info and sensory overload. But I would say have a little go on your own even if you get it totally wrong and the clay flies all over the place you've got to start somewhere and learn how to learn on your own, as the teacher can only help you so far with watch and repeat steps, the rest is up to you. We say when you have thrown a ton of clay you are no longer a beginner. Professionals may have spent years perfecting their craft by repeatedly throwing and throwing the Pot away, back in the recycle bin and keep reusing the clay for practice. Ceramists have encountered many failures. You learn that failure is part of the process as you learn through all your mistakes. You soon look to the future of how to improve the next pot instead of looking back at your loss. I was a little younger when I first experienced clay as my father is a potter, and so, my twin sister and I would often be in the studio waiting for dad to finish. But looking back it was always being left to my own devices to experiment that I learned how to use my hands and how the material worked. If you sit there and try a little bit of this and a little of that, use your fingertips here, use your palms there, how hard do you push, how fast do you go? You will eventually figure it out along with a professional potter guiding you through all the steps. During your session, let your teacher know if you want more help, equally if you want more space to trial and error on your own, let them know too, otherwise, teachers can be eager to get results out of you so that you feels accomplished. By all means, you are not meant to master throwing in the very short amount of time given as it is only your first time, as a beginner or taster session at that, and this activity may often take years if not weeks to master. I often find attendees think they should be good at it straight away especially as the demonstrations are performed with such ease by professionals. When it is ones the first time many people say they ‘do not know what they are doing’ when in fact they are doing perfectly well and exactly what they ‘should be doing’. To be honest, you never know how the pot is going to turn out, it is only finished until it has come out of the final glaze firing. Don't feel too disheartened or frustrated when you get one 'wrong' just ask yourself or discuss with the teacher what went wrong so that you learn from your mistakes, be happy and keep going! With patience and perseverance, it all works out in the end, and remember it’s just clay!! To book onto Freya's Clay Club classes have a look at her full timetable here and work out what times work for you.